This article is a compilation of comments at ENENEWS, some of them mine, Wecompiled this on Feb 9, 2015. On May 27th, the NRC sent a letter to Pilgrim stating that they were dissatisfied with Pilgrim's preparation and performance. They would likely be subject to increased inspection. Stock here: how about a $100M fine for putting Boston at risk? Pilgrim was very close to being forced to directly vent radioactive steam into the environment / neighborhood. They used every last line of defense they had, including dumping radioactive steam into the old BWR Torus aka Surge Tank. Even then the heat in the surge tank got so high, they had to use an emergency heat exchanger to cool the surge tank. Fortunately it worked. If that last piece of equipment had failed it would have been a serious accident with radiation exposure to the public. Pilgrim had the same types of equipment problems in the last 2 years, and FAILED to fix them, and the NRC failed on adequate follow up. Instead of shutting down these most dangerous type of plant the BWR reactor, similar to Fukushima which is still dumping radiation into the Pacific Ocean, instead, they attack solar and wind. An excellent analysis, must have taken at least 16 manhours of work---complete with schematic drawings and annotations. Regarding Pilgrim NPP, they resumed providing electricity to the grid yesterday, Feb 7th. This is an analysis by the Union of Concerned Scientists of the sequence of events at Pilgrim two weeks ago. Everything apparently didn't go as smoothly as the folks at Pilgrim would like us to believe. Credit to the folks of Cape Cod Bay Watch. Freaking nice report! They had multiple failures of critical emergency equipment, and they kept on reacting from one emergency to the next until they were dumping radioactive steam into the "torus" the big round dump tank at the bottom…the last resort before venting to atmosphere. An old BWR with a history of the same type of problems….sheesh, that was freaking close. I mean who the heck needs Boston or the East Coast anyway…..only nuclear can save the planet! Incorrect Nukemann, it was a close call. 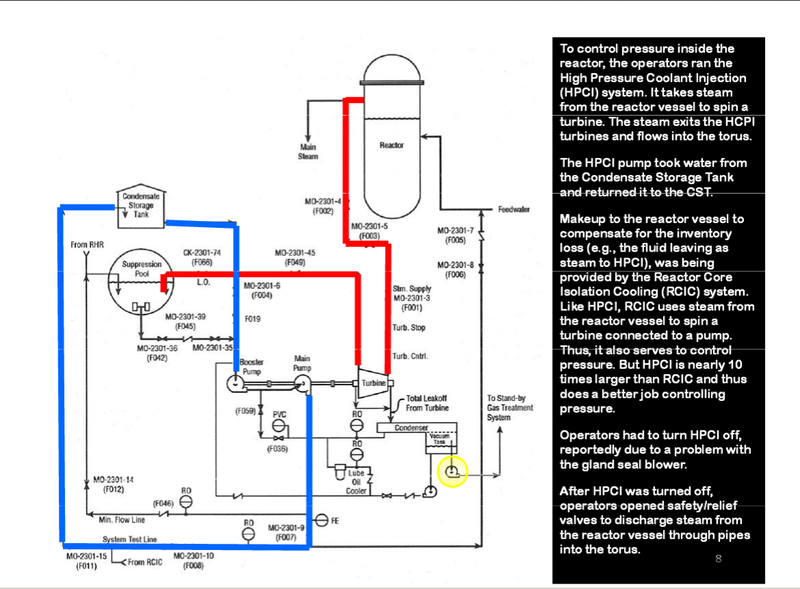 they lost control of the reactor steam venting valve, and failure of the diesel driven compressor that would allow them to close that valve once a safe reactor pressure was reached. So if there had been more residual heat in the reactor (say by losing both power feeds at the same time) and that valve stayed open, then the torus may not have been able to handle the heat rejection and a radioactive steam release would be needed to prevent an overall system blowup. hmmm...and you wonder, why did almost no one else in the area lose power? Because the problem was in Pilgrim own switchyard with lousy insulators that the NRC posted guideline as known problems when on the ocean. I see that you are still following "yes Vermont Yankee" how sad is that?